I first came across The Birthday Massacre back in early 2013 when I was sent their 'Hide & Seek' album to review for Fireworks. I immediately fell in love with their unusual mixture of Electronica-based, synth-filled, Pop-centred (occasionally heavy) Alternative Rock, and I have been a big fan from that moment. Sadly, every tour since that review has found me unable to attend for various reasons. Therefore, when I saw them announce that they were not only touring the UK again, but also playing local to me in Southampton, it was a no-brainer to grab the opportunity to finally see them live. My interest in the evening was further piqued by the inclusion of Lesbian Bed Death as main support for the tour. 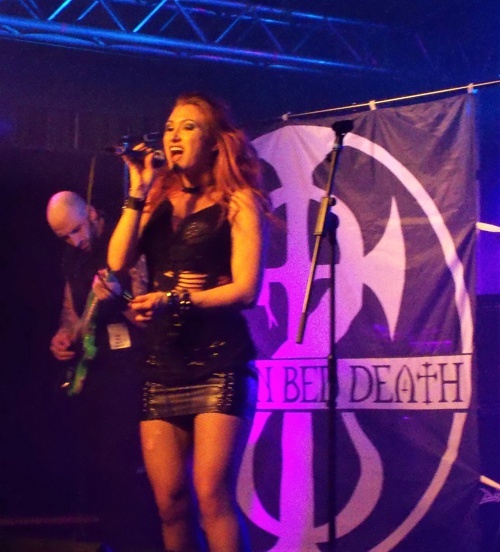 I first came across LBD when – as Fireworks Reviews Editor – I was sent their 2013 album 'The Devil's Bounty Hunters', and more recently their 2016 release 'Evil Never Dies' for review. Their lively and entertaining Gothic/Punk-tinged Hard Rock caught my attention, aided by the fact that being a massive Horror film fan myself, their Horror movie filled lyrical content was also a winner with me. The full line-up for this evening's gig actually extended to four acts with Biomechanimal opening and Pythia second. I would like to offer my apologies to both of those bands that I wasn't able to review either of their sets. During the break prior to the arrival of Lesbian Bed Death, I turned to the friend who attended with me (a huge Birthday Massacre fan) and mentioned to him that not only was I looking forward to Lesbian Bed Death, but it was my opinion that he would really enjoy them and their Hard Rock sound... and it turns out I was right on all accounts. With the stage in darkness, drummer Aaron Samedi and guitarists John "Dr. Powerful" Caci and Mr. Peach first arrived on stage, soon followed by vocalist Sienna Venom once they fired up their engines. They kicked off their set with 'I Use My Powers For Evil' and the immensely fun and rather catchy 'Son Of A 1000 Maniacs' (based on 'A Nightmare On Elm Street'/Freddy Kruger), and then backed those up with 'Evil Never Dies' and 'Satan In The Swamps' – the opener the title track from their debut release and the latter three from the latest album. Musically they sounded really good with the guitars, whether they were thick and chunky power chords or fast and furious riffing, clearly audible and the drums pounding out solid but not over-bearing rhythms. 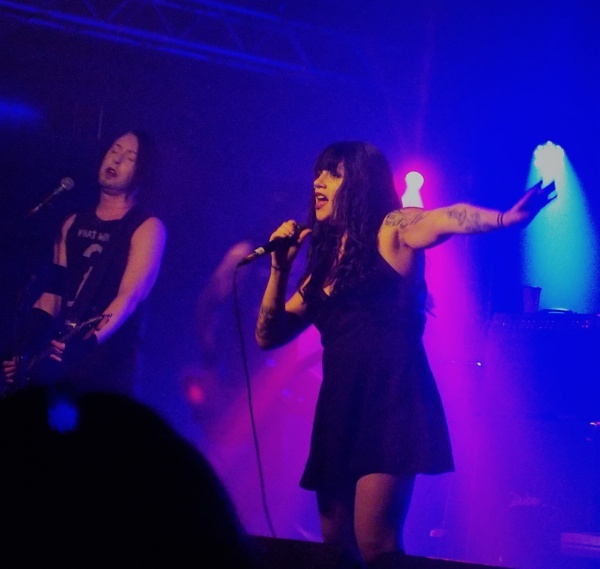 Vocalist Venom not only has a fine voice in the live environment – one that suits the music well – but also a very captivating stage presence. She was constantly moving, dancing and shimmying, and at one point I noted that the moves she displayed reminded me of a Hard Rock version of Salma Hayek's character in 'From Dusk Till Dawn'. There was also plenty of humour and interaction between songs from Peach which increased the sense of fun. After '...Swamp', Peach informed the audience they were due to star in a horror film called 'Clownface' which nicely lead into another fun and entertaining offering with the riff-fuelled 'Video Nasty'. Following the appearance of 'Chains', Peach spoke about the fact that it was Caci's last show and also spoke about the fact that they had no bassist at present. To make up for that, they were then joined on stage by Birthday Massacre's Nate Manor on bass for a ripping rendition of the infectious 'Halloween' (from their 'Riot Of The Living Dead' album) to close out their set. I was hoping that Lesbian Bed Death would live up to the expectations I had in my head and they did. They are a highly entertaining live act and having had the opportunity to chat with them after the show, a very friendly and approachable group to go with it. I look forward to seeing them again live the next time they venture down south. After another short break, it was the turn of The Birthday Massacre and the chance to strike off another of the "Yet To Be Seen Bands" from that list. As the lights went out, the various band members burst on to stage before they powered into the big groovy opener 'Counterpane' from the new album. The keys were crisp in the mix with the guitars and bass powering out. Vocalist Chibi bounced around the stage as she belted out her lyrics. During 'Red Stars' there was massive movement all over the stage by every member of the band, which made for a highly entertaining visual show as well as a musical one. This included Owen on keyboards who bordered on maniacal at times as he climbed all over his keyboards and stand as he played; he was equally energetic when he stepped out from behind them with a keytar. There was a particularly big cheer from the audience after this one. They followed this with the beautiful shimmering keys of 'Kill The Lights' and the fine guitar/bass/keyboards mix of 'One'. The style of music, energetic stage presence and an equally lively lighting display had all combined to make for a rather unique show – even at such an early stage. There were more thick guitar riffs during 'All Or Nothing' before the huge bass and synth-filled 'Destroyer' during which Chibi was really rather menacing – both vocally and visually. This number also featured lots of clapping from the audience who were clearly very much into the show by the reactions from those around me; they also gave a massive cheer at the conclusion of this one as well. 'Superstition' and 'Lovers End' were up next, the latter featuring a massive wall of synth bass and guitars, as Chibi was once again prowled around and spat out the vocals with menace, which bordered on maniacal by the end of the song. Not only was she a very busy performer during this show, as she moved from side to side of the stage, spun and bounced around centre front or danced and twirled around near the drums at the rear as the other performers stepped forward, but she was also very theatrical, both visually and vocally she changed persona to suit whichever song the band played at the time. She also had great eye contact with the audience, especially those right at the front, and constantly used her outstretched hands to point at or signal to the audience. 'Video Kid' had a nice intro and a great bounce and beat to it. It was during this song that the band also showed they can handle the odd unexpected hiccup as the bassist broke his strap and continued just holding it up. First Chibi tried to assist him as she continued with her vocals, before keyboardist Owen whipped over that side of the stage and lent a hand. With everything finally sorted, they then unveiled 'Under Your Spell' – the title track from the latest album – which was built on a superb beat and lots of keys with both a keyboard and guitar solo, before there was more theatrics from Chibi during 'Games'. There is one particular song from The Birthday Massacre that always gives me goose-bumps – both music and with its lyrics. It was the opening track of the album I reviewed all those years ago, and therefore the first song I ever heard from them. I really hoped, from the very moment I agreed to go and review this show, that they would play this one song. At this point of the proceedings, I got my wish as the pulsing synth quickly announced the arrival of 'Leaving Tonight'. The keys pinged out brightly before the guitars revved up and added their thick chunky riff. This awesome selection was my undoubted highlight of the night, and despite the fact that Chibi lost her voice for a few short moments, it didn't spoil it at all. She then announced they had no intention of going off stage to then return for an encore, instead they intended to simply continue with the music. This last section of the gig consisted of three songs, the first of which was 'In The Dark' with it good mixture of keys and guitar as Chibi continued with the theatrical movement and vivid facial expressions. The penultimate offering this evening was 'Endless' with its rather beautiful combination of quiet verse and big bouncing chorus. The end of the night was then upon us, and Chibi and company closed the show with 'Blue' which saw TBM's leading lady vocally go from sweet and airy to aggressive and hostile in a heartbeat as the song progressed. 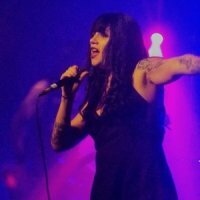 With a big roar of "Southampton, Thank You", she put her mic down, bounced off stage and left the remaining band members to play out bring the show to an end. The Birthday Massacre were absolutely fantastic tonight. First up, I was exceedingly impressed with them musically, their sound simply poured out the speakers. Given their music features many facets (drums, synths, bass, two guitars and vocals) and is extremely dense at times, it all sounded amazingly clear with each part clearly audible. From a visual perspective, to say they were high-energy is something of an understatement. Aside from the theatrical nature of some it, the various band members were a blur of motion throughout the set. When you combine all this, it makes for an excellent show that is also a bit different on many levels. As you can probably guess by the length of this review, I thought tonight was excellent all round and I look forward to hopefully catching both bands live again sometime in the, hopefully, not too distant future.